Did you just pick up a new iPhone X today? Have you bought a new iPhone 8 or iPhone 8 Plus over the past month? Well guess what: your new phone finally supports fast charging! Oh, but it doesn’t actually, you know, work. At least not out of the box. If you want to charge your new iPhone as fast as possible, there are two things you’ll need and neither one of them actually comes with the phone. First, you’ll need a USB-C to Lightning cable since true fast charging only works over USB-C. Check out the Metrans USB-C to Lightning Cable, a $10 cable that’s just as good as Apple’s $30 cable. Then you’ll also obviously need a USB-C wall adapter. 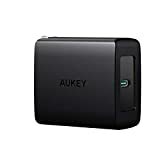 We recommend the AUKEY 27W USB-C Charger with Power Delivery 3.0, which is a top-quality wall adapter at a surprisingly low price. ☆No More Need Adapters: Connect your iOS devices directly to new Macbook Pro 2016, MacBook 12-inch, Google Chromebook, or HP Pavilion X2, type C power banks and any other type C devices. Fast charging your device and high performance video and audio transfer to meet a variety of everyday connection and charging needs. ☆High Performance: High quality Aluminum housings and rugged nylon fiber jackets increase the durability of the cable and the reversible design of the USB C, which can help you plug and unplug easily without checking for the connector orientation. ☆Charging and Data Transfer: Charging current up to 2.4A. Use it to charge up your phone and other standard USB devices or data transfer (up to 480 Mbps). ☆Lightning side complete charge and sync with iPhone X iPhone 8/8 Plus 7/7 Plus, iPhone 6 6s/ 6 6s Plus, iPhone 5, 5c, 5s, iPod Nano 7, iPod Touch 5, iPad 4, iPad 5, iPad Air 2, iPad Air, iPad Mini 3, iPad Mini 2, iPad Mini Retina. Reversible USB-C connector is compatible with New Macbook 2016, Google Chromebook, or HP Pavilion X2 and any other usb c devices. ☆What You Get: Metrans 3.3ft(1M) USB Type C to Lightning cable with a snap-strap to keep it coiled when traveling or not in use. 24-month Warranty and Lifetime Free Customer Service. Any Problems, Please Feel Free to Contact us.